How Much Heat Can A Kerosene Heater Give Off? Are kerosene heaters useful or a ghost of the past come lately to haunt your dwindling garage storage space? Contemporary electric heaters may be affordable, powerful, and energy efficient. But there are still reasons to keep a kerosene heater around. Kerosene heaters work without electricity, can be used for camping and can efficiently heat a larger space than most electric heaters. 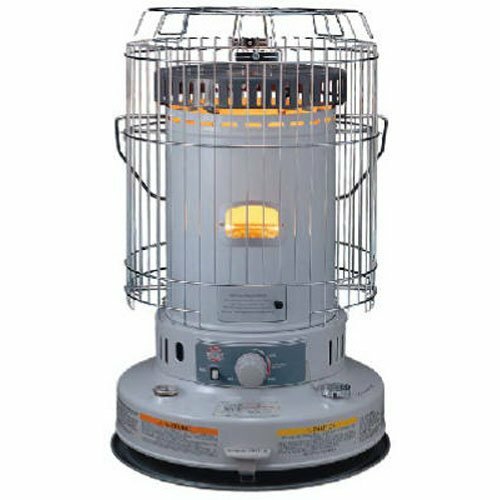 Here we’ll cover some of the pluses and minuses of kerosene heaters and look at a few of the best models on the market. 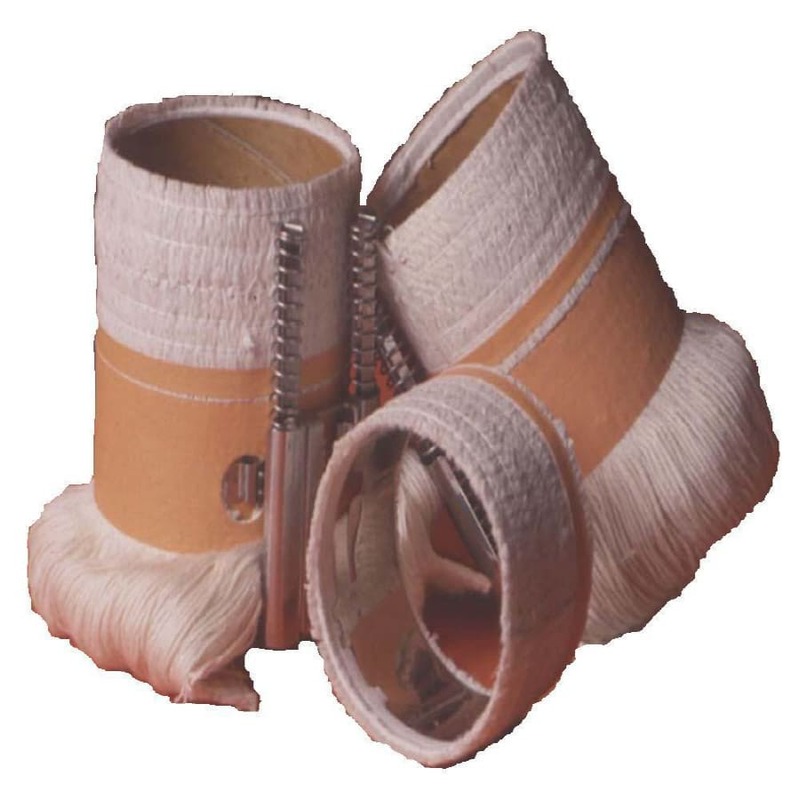 Find out more about why these make a great option for keep cozy during cold weather! In order to heat a room that is approximately 10’x10’x10’ with moderate insulation should require roughly 9,000 BTU per hour in winter. The average electric space heater is capable of putting out about 5,000 BTU/hr. 5,000BUT/hr is enough to warm the room a bit but not get it to a comfortable level. By contrast, a good commercial kerosene heater should put out 10,000 BTU/hr, sometimes even more. To take it even further, “contractor” kerosene heaters–meant for industrial spaces and professional applications–can produce as much as 40,000 BTU/hr. What this means is that a good kerosene heater will heat your room more efficiently than an electric space heater. It is a better option for large spaces. They’re also efficient for heating areas outside while camping, keeping a bedroom or family space warm during a winter power outage or for heating a large, unpowered space like a garage or a storage container. In this article, we’re going to focus on portable home kerosene heaters rather than the large, installable contractor heaters. Contractor units can be very expensive and are not suitable for home use. 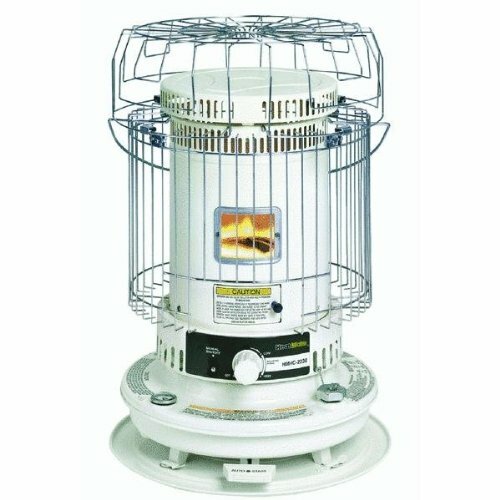 The two main types of kerosene heaters are radiant and convection heaters. Convection or convective heaters tend to be round, like a glass oil lamp someone would carry through a dark, haunted house in a movie. These heaters are generally best for large open spaces since they give off heat in all directions and are meant to be placed in the center of a room. Radiant heaters are often square and contain a metal grid that will glow to red hot. They’re usually meant to be placed near a wall and pointed in the direction you’d like heat to flow. Because the metal grid holds in heat better, they actually can work outdoors without heat being lost. Keeping your kerosene heater will require a good wick and the proper fuel. With regards to fuel, The New York State Department of Agriculture and Markets, Bureau of Weights and Measures delineates two types of kerosene: K-1 (or 1K) and K-2 (or 2K). The difference between the two is the sulfur content and purity. Most kerosene heaters will require K-1 which should be clearly indicated on the fuel tank. This is because K-1 is a purer form of kerosene and will not deteriorate internal air quality as much. The other important thing to manage is your wick. Many kerosene heater issues can be fixed by adjusting or replacing your wick. Kerosene heater wicks are wide and straight, like the hem of a shirt. They must be kept clean and trimmed evenly or they won’t burn efficiently. By now most of us have been lulled into a sleepy daze of carelessness by the relative ease of electric heaters. Turn it on; don’t put it too near anything flammable; don’t forget about it. But that same sleepy daze around a kerosene heater might indicate carbon monoxide poisoning. One of the biggest drawbacks of a kerosene heater is that their convenience is at the expense of safety. 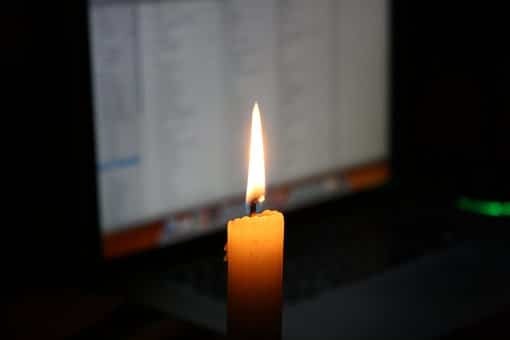 But this doesn’t mean you should avoid them or be frightened to use them in your home. It does mean you should be aware of safety precautions. This is maybe the biggest difference from a typical electric heater. Burning kerosene can decrease indoor air quality and put young children and elderly people at risk. These impurities can include airborne smoke, sulphur, and carbon monoxide. Signs of carbon monoxide poisoning include drowsiness, nausea, confusion, and headache, and can eventually lead to asphyxiation and death. Because of these risks, it is recommended only to use a kerosene heater in a well-ventilated area. If you’re using it in your home, keep a window or two cracked 1-2 inches to get fresh air. Fires are the other major concern. Unlike electric heaters, kerosene heats have an active flame inside them. Spilled fuel near the unit, furniture that’s too close or a unit that is knocked over all can cause your house to burn. 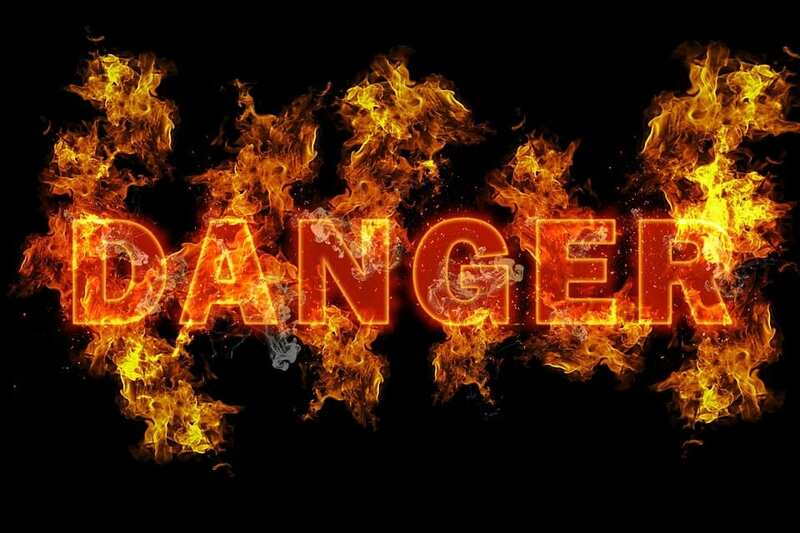 To avoid risk of fire, keep the kerosene heater several feet away from furniture, cloth and carpets. Avoid placing it where someone may trip over it. Don’t use the heater in the same spot where you filled it in case there was spilled fuel. Regularly check to make sure your unit is not leaking. We probably don’t need to remind you that children and flammable liquids don’t mix. That said, the National Fire Protection Association reports that a majority of kerosene heater-related accidents come from children being poisoned by ingesting kerosene. Always keep your kerosene fuel out of reach of children, in clearly marked and child-proof containers. If you’re looking for the best kerosene heater, you shouldn’t run around searching like a headless chicken. Instead, consider your heating requirements and check out our in-depth pros and cons to learn about some of the best models on the market. 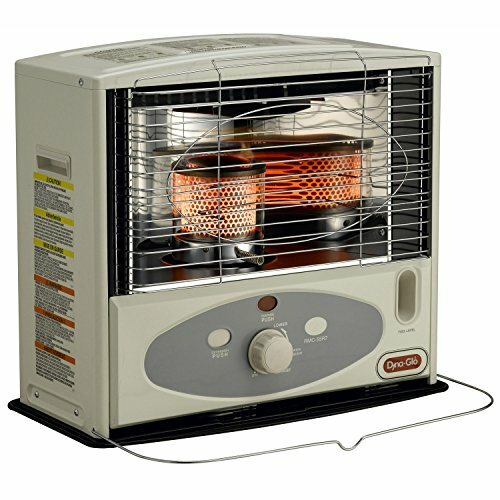 The RMC-95C6 is a 360º convection-style heater. It is rated at 23,000-BTU, and can heat 1,000 square feet for 8-12 hours. This design is ideal for an indoor situation, especially for rooms up to 1,000 feet. The KW-24G is a 23,000 BTU full-area convection-style heater. It has a long-lasting fuel tank that will run with intermittent use over the course of several days. It is rated for rooms up to 1,000 feet. This model is designed to heat up to 380-feet of space for either emergency heat or for zonal heating. It is portable and has 10,000 BTUs of power. The 1.2-gallon tank will last for 14 hours, while the heater includes safety features such as an auto shut-off and tip-over protection. This makes the unit perfect for homes with children and pets. 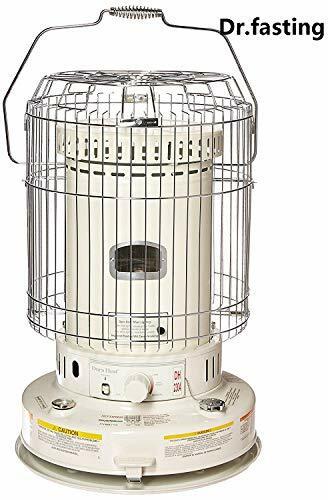 This is a great kerosene heater for smaller spaces. Although you cannot control the wick height, the flame controls are simple to use and the safety features make this a good choice for those with worries about their family’s safety. 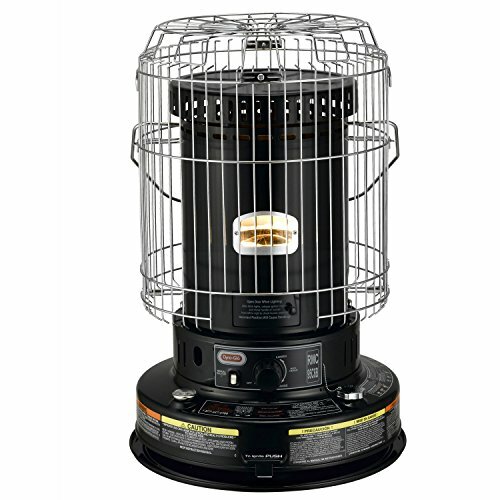 The RMC 55R7B is a forward-facing radiant kerosene heater. It is intended for spaces as large as 500 square feet, with a 10,000 BTU rating. The Heat Mate is a convection-style kerosene heater that offers full-area heat coverage. It is rated for 900 feet at 23,000 BTU. It takes clear 1K kerosene and can burn for up to 12 hours. 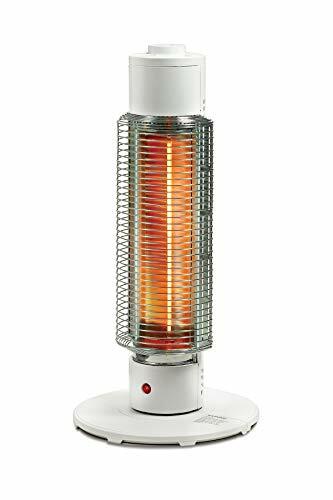 The DH2304 indoor kerosene heater is also a 360º convection-style heater. It is meant to be used indoors, offering 23,800 BTU. It can operate for 9-12 hour of constant heat. It has an adjustable wick knob and fully enclosed construction. Many people invest in kerosene heaters as emergency heat solutions so they often aren't used too frequently. It is important to know how to safely store and prepare your kerosene heater. Before storing your heater, be sure to empty the kerosene in the unit. Unfortunately, kerosene does not keep well and cannot be used season-to-season. It is recommended that you properly dispose of any leftover kerosene inside the heater. The easiest way to properly dispose of kerosene is to use up whatever you’ve filled the unit with. Otherwise? Contact local hazardous waste disposal companies or your local fire department and ask how to properly dispose of leftover fuel. Before you store your heater is a good time to replace or clean your wick. This is to ensure the heater is ready-to-go next time you need it. Cleaning/changing the wick before storage prevents you from getting caught in a bind during an emergency. Also replace weak batteries. When you next use it, double-check your wick & batteries, fill the unit with fresh kerosene, and it should be ready to go! Kerosene heaters may seem intimidating, but they’re an excellent item to keep around for emergencies. Or use them to lower your home heating bill in the winter time. With proper safety observed, they’re nothing to worry about. You may find yourself being very glad you had one during the next winter storm! Every style of unit is a bit different, but ultimately the important things to look out for are safety features and BTU rating. So don’t worry too much about the garage space, and go find yourself a solid backup to the standard electric heater!